I know that I always say this, but YES, these are actually the BEST VEGAN BROWNIES you are going to have! Full stop. They are gooey, they are chocolatey, they are fudgy. Ah! They live up to EVERY expectation you think a brownie should be. I’ve compiled ALL the tips and tricks from the internet, from old grandma’s recipes, from friends and relatives, to come up with the BEST recipe for vegan brownies! 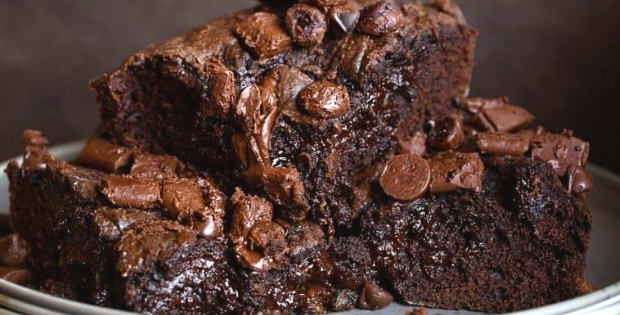 You can throw out any other recipe you have for brownies, because this is the one you will use for the rest of your life. Prepare the flax eggs as listed above, allow to sit for 15 mins while preparing the rest of the batter. Preheat your oven to 350 degrees. Combine all dry ingredients including the coconut sugar in one bowl, then set aside. In a medium saucepan over very low heat melt the baking chocolate while stirring constantly, then stir in the almond butter to combine. Remove from heat and allow to cool for a minute, then stir in the coconut oil, then the maple syrup and vanilla, add the flax eggs* and beat until smooth and well combined. Fold in the chopped dark chocolate (or morsels or chunks), then transfer the batter to a parchment lined 8x 8 inch baking pan, scraping to get all the batter. and bake in the preheated oven for 20-25 minutes or until just set in the center. ** Due to the coconut oil content I recommend chilling in the fridge to set prior to cutting. Drizzle with extra melted chocolate if desired. These brownies are at their fudgy-est after chilling in the fridge and then allowing to settle back to room temp for about an hour. Store leftovers covered in the refrigerator for up to 4 days, or freeze for later use. For 928 mind-blowing recipes that are beyond delicious, Download The 928 Tastiest Vegan Picks.